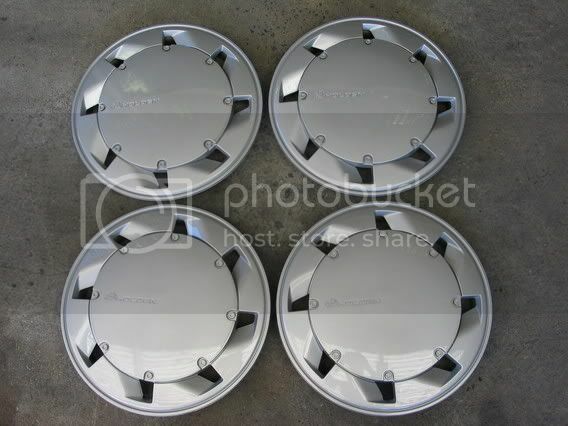 VL Turbo hubcaps, what are they worth? Discussion in 'General' started by rapier, May 2, 2007. Just a quick question, what are my VL Turbo hubcaps worth? They are in pretty good condition, just a few scratches here and there. Not looking to sell them on here, just want some opinions on what they are worth. I was told about $100 for the set? I'd say $100 would be bought right. But if you got some sorta collector interested that desperately wanted them you could probably get a lot more. Well the VL Calais Turbo's probably did but the turbo engine could be optioned on any trim level. The problem was, the VL Turbo's used larger brakes which required 15 inch rims rather than the stock 14's so they used 15" interceptors (which were also used on the BT1's) and threw some different hubcaps on them. dispite my opinion though i hope you sell them! I think I'll clean them up and respray, chuck them on eBay and see what I can get. Putting 16" 5 spokes on soon, so not in too much of a hurry to get rid of the turbs hubcaps.